As the name suggests ‘split‘ command is used to split or break a file into the pieces in Linux and UNIX systems. Whenever we split a large file with split command then split output file’s default size is 1000 lines and its default prefix would be ‘x’. As we can see the above output ‘tuxlab.txt‘ is split into two pieces with the name ‘xaa’ and ‘xab’. Let’s suppose we want to split a file with customize line numbers, let say I want max 200 lines per file. To achieve this, use ‘-l’ option in split command. Let’s suppose we want to split an iso file into 4 chunk output files. 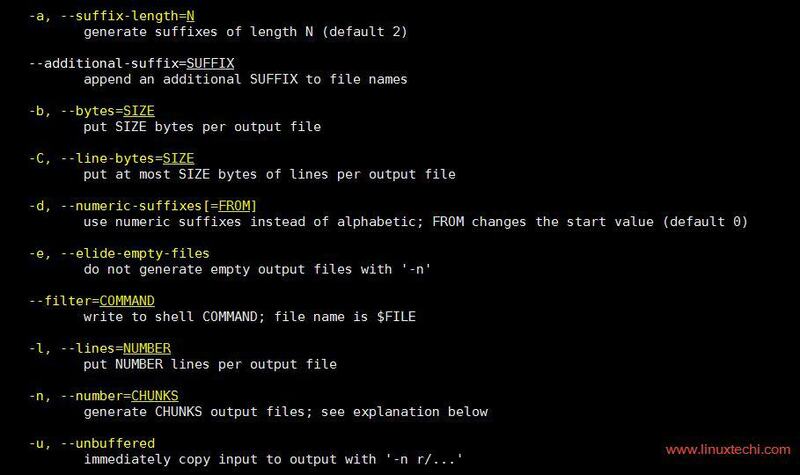 Use ‘-n’ option with split command limit the number of split output files. Verify the Split out files using ll command. Example: 10) Split ISO file and merge it into a single file. Let’s suppose we have a Windows Server ISO file of size 4.2 GB and we are unable to scp this file to remote server because of its size. As per the above output, it is confirm that integrity is maintained and we can also say split file are successfully restored to a single file. That’s all from this article, If you like these examples then please do share your valuable feedback and comments in the comments section below. Brilliant! Very detailed, thank you!